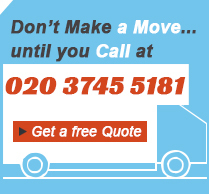 RemovalsMates provides relocation and removals services in New Cross, SE14. Our movers will help you with everything – packing, loading and transporting of your belongings. You have finally found a sunny, spacious office where your employees will feel good and now all the office equipment have to be transported to the new place? We got you covered. Our company is an expert in providing office removals services in New Cross, SE14 and all the other Greater London areas. Our professionals will show up on time and they will carefully pack the expensive office equipment. Then it will be loaded in a large truck and there will be no need to make several trips back and forth until all the items are transported. Call our operators now and make a booking. They are at your service every day. After years and years of living in your house one day you have found out that your garage and home are full of useless stuff you should get rid of, you have found someone to buy them, but you now need to get them there. Don’t worry we can do this for you – cheap fast and efficient way to remove your stuff- our house removals will do it for you. We work on the territory of London and more particularly in New Cross, SE14. Call us now and for today it will be your second best decision after choosing to sell your old furniture. Are you looking for a company to help you move all heavy items to a new place? Then you need us! We are one of the leaders in the business and have been providing customers with excellent removals services for several years. We have always done our best to satisfy every single customer of ours with ideal work, fast results and safety in our performance. There is no easier way to have your large furniture and other items relocated than calling us and ordering our removals services. We offer competitive prices that won’t affect your budget. For your convenience, we work every day of the week. If you want to ensure the safe and smooth removal of your items, choose the outstanding services of our company that specializes in offering office and home removals in New Cross, SE14. You can leave the whole organization of the transportation into the hands of our hard working staff. Even your fragile items will be protected in an effective way, thanks to our ideal equipment and methods of working. We can provide our removals services from Monday to Sunday, depending on your preferences. You can be sure that we will be punctual in our appointments and that we will take into account your preferences.